Recently acclaimed as “one of the most popular West End musicals ever" (Evening Standard), the Olivier Award-winning London production of the global musical phenomenon is already the 16th longest-running West End musical of all time. 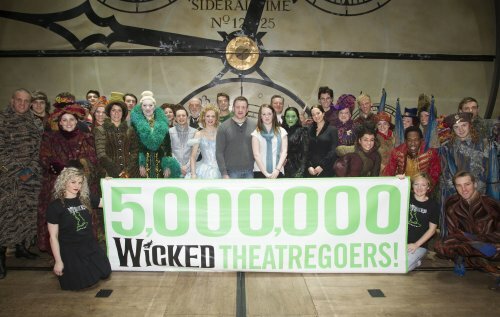 The London production, which is now booking into its 8th year, has broken countless Box Office records since its premiere in 2006 and still holds the all-time record for the highest weekly gross in West End history (taking in £1,002,885 during week ending January 2, 2011). While continuing its open-ended run at London’s Apollo Victoria Theatre, a major new production will tour the UK and Ireland, opening at Manchester’s Palace Theatre in September 2013. “The international blockbuster” (The New York Times) has now been seen by over 36 million people around the world and won 90 awards. The original Broadway production, which is now in its 10th Anniversary Year, has remained Broadway’s highest grossing show for an unprecedented 9 consecutive years. Wicked has been shortlisted as one of the four nominees for the 2013 ‘BBC Radio 2 Audience Award’. The winner will be announced at this year’s Olivier Awards on Sunday 28 April 2013 at the Royal Opera House in London. Wicked previously won this award in 2010 and was shortlisted in 2012. 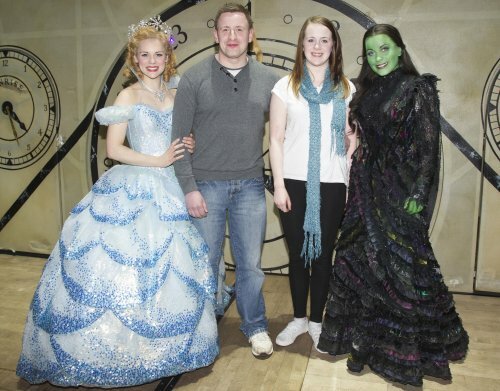 UK Executive Producer Michael McCabe said: “All long-running shows depend as much on audiences coming back for more as they do on first-time visitors, and Wicked is no exception. We have been swept along to the incredible milestone of 5 million visitors by passionate fans and incredible word-of-mouth that inspires new ticket buyers every day. We are truly grateful to everyone who continues to make Wicked such a popular and enduring success and to all those who supported Wicked in the public vote for the BBC Radio 2 Audience Award. We are all delighted to be shortlisted for this very special Olivier Award for a third time”. Based on the acclaimed novel by Gregory Maguire that ingeniously re-imagines the stories and characters created by L. Frank Baum in ‘The Wonderful Wizard of Oz’, Wicked tells the incredible untold story of an unlikely but profound friendship between two sorcery students. Their extraordinary adventures in Oz will ultimately see them fulfil their destinies as Glinda The Good and the Wicked Witch of the West. Wicked has music and lyrics by multi GRAMMY® and Academy Award® winner Stephen Schwartz, a book by Winnie Holzman, musical staging by Wayne Cilento and is directed by two-time Tony Award® winner and Olivier Award nominee Joe Mantello. Wicked is based on the acclaimed novel, ‘Wicked: The Life and Times of the Wicked Witch of the West’, by Gregory Maguire. Wicked is produced by: Marc Platt, Universal Pictures Stage Productions, The Araca Group, Jon B. Platt and David Stone. Executive Producer (UK): Michael McCabe. 1 minute from London Victoria Mainline and Underground Stations.